Great stylish shoe, super comfy, sizing is perfect. MatchinG socks look cool together! Comfy, stylish and fabulous with the matching socks! love the color, style and quality of the shoes! I own 40 plus pair of the zero grand and the original grand. This shoe is very stylish with many color combinations and most of all, extremely comfortable. I will continue to purchase this style. It looks cool and comfortable. Very comfortable and stylish. I liked the colors too. I won another pair (different color) and I LOVE them. They are great quality, great style and extraordinary comfortable. In the past year, I've walked miles and miles in San Francisco, London and New York in my Cole Haan shoes! A gift for my husband! I like the colorful sole on top of a neutral shoe color so I can wear them all the time. I have a pair in a different color, super comfortable... Want something that shows class and style while still being sporty. Big Cole Haan fan! This is my 6th Zerogrand. Comfortable and dressy. I own about 10 pairs of the ZEROGRAND mens shoes, in one word, they're terrific. In a few more words, they are light, durable (and I'm a bigger guy), very comfortable and fun. ive seen these shoes - and they just stand out without looking odd. comfy - and stylish - what else doyou want! Great shoes...and very current colors available. orange in support of MS...make a donation! I love this shoe, it is amazingly comfortable and good looking. These are stylish and incredibly comfortable. Very versatile to dress up or wear more casually. A fun casual Friday shoe and/or with shorts. Had before and very comfortable & light with or w/o socks. True to size. Are they non slip ? I work in a restaurant and deal with wet floors . IMO they do a pretty decent job at not slipping. Basically, they're like sneaker soles. So if your rubber Nikes don't slip, neither will these. They're amazing! like wearing tennis, but much nicer! are the holes closed on this shoe? BEST ANSWER: Yes the holes are closed, there is another piece of material under them to give it a great look. open. It is actually pretty nice unless you are walking in the rain. 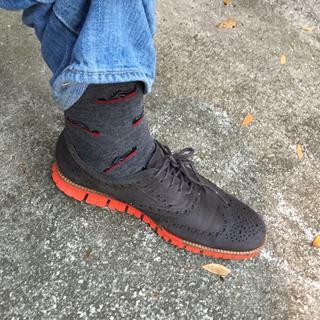 Does anyone know if Cole Haan will make more of the Pavement Leather Spicy Orange combo? BEST ANSWER: We love that you are liking the color combos! Sorry to say this one was a limited production style and is completely sold out. Stay tuned to the website for new Fall 2017 styles and colors. Only their product team knows, but that is an awesome shoe. So many good colors though. The real solution is CUSTOM ZERO GRAND. I have looked through everyone of these types of shoes and not been able to find a size 14. Can someone please help. I received an email today saying that due to popularity they were out, but then it also said that the shoe was discontinued. What gives? BEST ANSWER: If 14 is your size, you can shop by size, color, width and style by using the drop-down menu on the men's shoe page and Viola! - there you will see all available size 14 styles. Had ordered these and the order was cancelled. I can't find any of these in a size 14. Was looking forward to sporting them. I received an email giving me a 25% discount, but I can't find any in my size to even order. Help please? BEST ANSWER: For assistance with finding your size, please call our online Customer Service Team at 800-695-8945. They will be able to help you.